Tag Archives: USEF Youth Reining Nat’l Ch. Oklahoma City, Okla. – Rising stars in reining came to the 2016 USEF Youth Reining National Championships on July 2 with the goal of claiming a national title. Held in conjunction with the NRHA Derby at the State Fair Park in Oklahoma City, Okla., Amanda Hurd took home the USEF 19-21 Youth Reining National title, Alexandra Johnston earned the USEF 14-18 Youth Reining National title, and Bo Van Duys was the USEF 13 & Under Youth Reining National Champion. All three divisions were judged by Ben Balow, Bob Kail, and Ann Salmon. Twenty-year-old Hurd (Wilmington, Del.) claimed the USEF 19-21 Youth Reining National Champion title. Riding her father Mark Hurd’s seven-year-old Quarter Horse sire, CC Enterprises, Hurd guided her young mount to a score of 194. Seventeen-year-old Johnston (Brentwood, Tenn.) claimed the USEF 14-18 Youth Reining National Champion title. 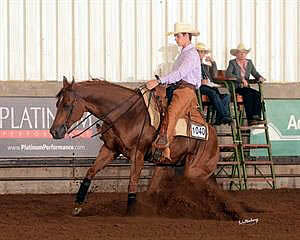 Riding her own eight-year-old Quarter Horse gelding, Mr Get Smart, Johnston earned a score of 203. Eighteen-year-old Elena Hurd (Wilmington, Del.) and It’s All About Bud, her father Mark Hurd’s 10-year-old Quarter Horse gelding, received a score of 190 to earn the USEF 14-18 Youth Reining Reserve National Champion title. Van Duys, a 13-year-old resident of Parkland, Fla., scored top honors in the USEF 13 & Under Youth Reining National Championship. She and Aim Your Pistol, her own 10-year-old Quarter Horse mare, laid down a solid run, scoring 208 and claiming the title. The USEF 13 & Under Youth Reining Reserve National Champion title was shared by Ava Bush and Lisa Prittle. 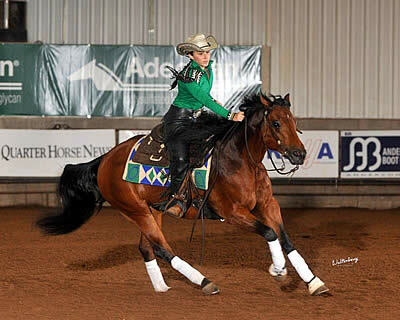 Bush piloted Wimpy Whiz Kid, Easy N TIme Ranch LLC’s seven-year-old Quarter Horse gelding, to a score of 199.5, as did Prittle with her own Last Pop Star, a 10-year-old Quarter Horse gelding. Find more information on the NRHA Derby. Alexandra JohnstonAmanda HurdBo Van DuysReiningUSEFUSEF Youth Reining Nat'l Ch. Oklahoma City, Okla. – Rising stars in reining came to the 2015 USEF Youth Reining National Championships on Saturday, June 27 with the goal of claiming a national title. Held in conjunction with the NRHA Derby at the State Fair Park in Oklahoma City, Okla., Emmy-Lu Marsh earned the USEF 14-18 Youth Reining National title and James Belden, Jr. was the USEF 13 & Under Youth Reining National Champion. Fourteen-year-old Marsh (Tallulah, La.) was the 2014 13 & Under Champion and was still in top form a year later as she claimed the USEF 14-18 Youth Reining National Champion title. Riding her own four-year-old Quarter Horse gelding, Who Whiz Porter, Marsh guided her young mount to an excellent score of 143.5 from the judging panel of Doug Milholland and Brenda Brown. The USEF 14-18 Youth Reining Reserve National Champion title went to 16-year-old Annabeth Payne (Tallahassee, Fla.) after she piloted Chexamillion, her own nine-year-old Quarter Horse gelding, to a score of 136.0. Belden, Jr., a 13-year-old resident of Wellington, Fla., scored top honors in the USEF 13 & Under Youth Reining National Championship. He and TR Chic Magnet, his father James Belden’s 13-year-old Quarter Horse gelding, laid down a solid run, scoring 136.0, and claiming the title. Twelve-year-old Bo Van Duys (Parkland, Fla.) and Wimpys Lucky Girl, her mother Holly Van Duys’ six-year-old Quarter Horse mare, received a score of 134.5 to earn the USEF 13 & Under Youth Reining Reserve National Champion title. Learn more about the USEF Youth Reining Program. Emmy-Lu MarshJames Belden Jr.ReiningUSEFUSEF Youth Reining Nat'l Ch. Lexington, Ky. – The United States Equestrian Federation (USEF) is pleased to announce the dates and locations for the 2015 Adequan/USEF Open Reining National Championship and 2015 USEF Youth Reining National Championships. Held as a CRI3*, the 2015 Adequan/USEF Open Reining National Championship will run during the High Roller Reining Classic, September 11-20, at the South Point Arena and Event Center in Las Vegas, Nevada. Learn more about the High Roller Reining Classic here. The 2015 USEF Youth Reining National Championships will once again hold championship competition across three divisions, 13 & Under, 14-18, and 19-21, as it runs June 20-27, at the State Fair Arena in Oklahoma City, Okla. in conjunction with the NRHA Derby. Learn more about the NRHA Derby here. Learn more about the USEF Youth Reining Program here. ReiningUSEFUSEF Open Reining National ChampionshipUSEF Youth Reining Nat'l Ch. Lexington, KY – The United States Equestrian Federation (USEF) has announced the list of Youth Reining Riders who have qualified for the USEF Youth Reining National Championships to be held in conjunction with the NRHA Derby in Oklahoma City on July 2, 2011. The USEF will award Youth National Championship titles in three age categories: 13 and under, 14-18, and 19-21 age divisions. The Youth qualified for the USEF Championships by earning points in Qualifying Classes throughout the country in 2010-2011. More information regarding this event, including the prize list is available here: http://www.usef.org/_IFrames/breedsdisciplines/discipline/allreining/developingYR.aspx.